"An extreme dirt biker rider performs a stunt at Dover International Speedway on September 28, 2014 in Dover, Delaware." The best part of being out shooting anything you never know what you might stumble upon. During the stock car race in Delaware, I was walking back from a client assignment outside of the track when I noticed something soaring thorugh the air. 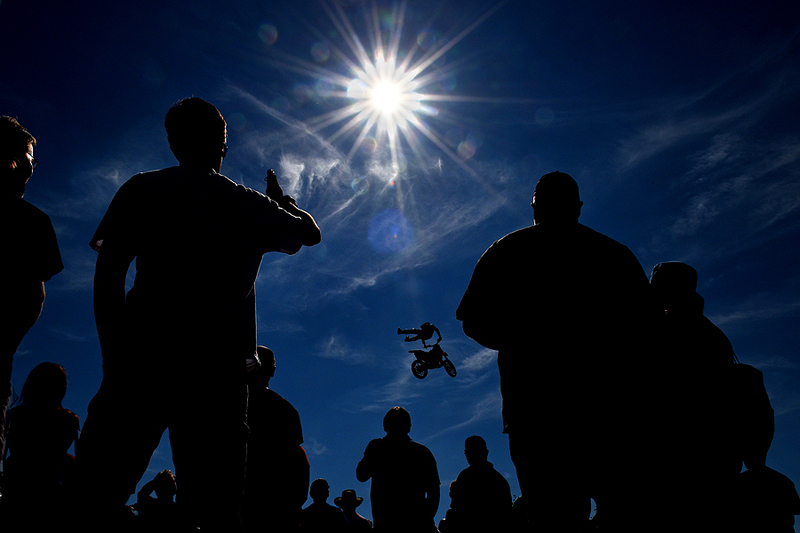 Having never photographed dirt bike stunt riders, I took a couple minutes to play with the light. Years ago, I had the chance to photograph the X-Games for one day - but never the motocross guys and girls. This may have been the closest thing I've had the chance to photograph like it since, but it was a fun couple of minutes. I wish I would have had more time to play with the light and high-flying stunt riders. Awesome moment, and great framing. A very unique thing to catch!